This UV-stable, acetone-based liquid dye was developed for both interior and exterior use. It is composed of solid-ground color particles in a solution, so it is designed to penetrate open concrete surfaces, including polished surfaces, according to Tim Frazier, a seminar trainer from The Stamp Store in Oklahoma City. What makes this dye different is its unique proprietary formulation, which is what make it UV-stable. Also, it comes as a liquid, so it mixes and is ready for use quickly. SS DYE-namic can be used with almost any type of sealer. Because of the acetone base, DYE-namic doesn't leave a lot of residue. "You can seal right after the application," Frazier says. "It has a high flash point and dries immediately." The product can be used as a wash - incorporating the dye into sealer - which allows users to do one application instead of two, saving both money and time. Also, mottling agents can be used to achieve distinctive appearances. Frazier always recommends testing and getting samples prior to application. 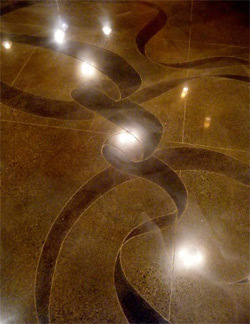 DYE-namic, which was selected as Editor's Choice-Decorative by the Most Innovative Products award program at the 2010 World of Concrete, can make a good replacement for acid staining. Frazier notes that even after concrete gets to a point where it no longer accepts an acid stain, DYE-namic can still be applied on top of the stain. The dye has been well-tested by staff at The Stamp Store and outsourced to others. "In my tests alone, two years prior to it being brought out, I haven't had any blushing or fading," says Frazier. "It's the only dye I've used that hasn't faded outdoors." The product has only been on the market since 2009, but Oklahoma City contractor Josh Cunningham of Artistic Stone Surfaces is already a big fan. He started to use DYE-namic because of the problems with acid stains that he has encountered over the years. "I did a lot of work for a landscape architect that included a number of add-ons to patios, as well as add-on stamp work," says Cunningham. "We used the DYE-namic on the patios to get a uniform color. That way we won't get two pads of different colors." 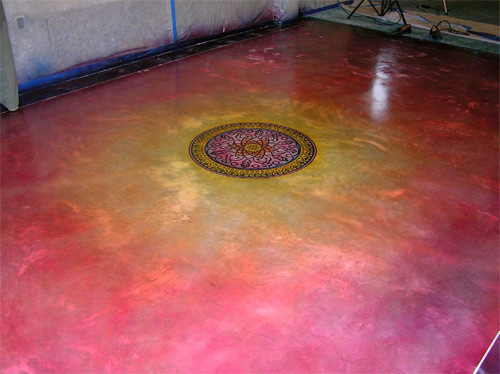 He also likes to mix the DYE-namic with solvent-based sealers for touch-ups on acid-stained concrete. Cunningham has even antiqued with the dye. There are 23 colors of DYE-namic, including primary colors, that can be mixed into virtually any color for any project. It comes in quart, gallon and five-gallon sizes. "Overall, it's like just about any other dye out there," says Frazier, "except you can use it outdoors as well as indoors."